Need to hide a WooCommerce category from the shop page? Sometimes you might have products that you don’t want to publicly list on your shop page. To your dismay, though, WooCommerce doesn’t include any core functionality to hide categories from the shop page. To help, we’re going to show you how you can hide one or more categories from your WooCommerce shop page via a user-friendly plugin. Our simple written instructions and video will show you how to customize how your hidden WooCommerce categories function – all without writing a single line of code. There are lots of reasons why you might want to hide WooCommerce categories from the main shop page. For example, maybe you’re creating a WooCommerce wholesale store and need to hide the wholesale categories from the shop page. Maybe you’re selling customer-specific products, with a hidden category for each company. 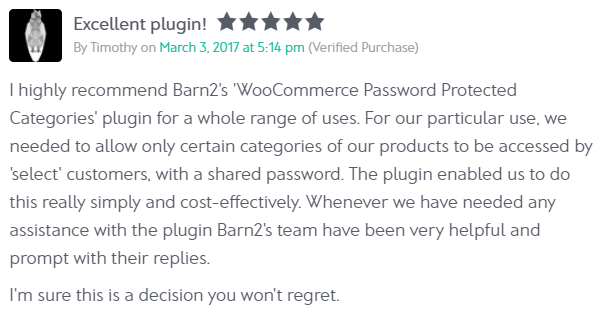 Whatever you’re reason, unfortunately WooCommerce doesn’t come with an option to do this. Isn’t very user-friendly because it requires you to work directly with PHP code, rather than a human-friendly interface. Makes it difficult to change which categories are hidden later on, because you’ll need to dive back into the code every time you want to make an adjustment. Gives you more flexibility than the WooCommerce PHP function in terms of how shoppers interact with your hidden categories. Lets you choose which categories to hide right from your WordPress dashboard. Lets you decide whether to hide categories from the shop page completely, or whether to show them but require customers to enter a password or login to access a protected category or its products. Start hiding WooCommerce categories from the shop page today. Requiring users to enter a password before they can see the hidden category (or categories). Only allowing logged in users with specific roles to see the hidden categories. Only allowing specific individual users to see the hidden categories. The plugin also offers more advanced functionality, like whether or not to still list your hidden categories in navigation menus or sidebars. Below, we’ll show you how to hide a WooCommerce category from the shop page using WooCommerce Protected Categories. Once you’ve installed and activated WooCommerce Protected Categories, go to Products → Categories to choose which categories to hide from the shop page. Password protected. Visitors will need to enter a password to see the category. You can create multiple passwords to unlock the category if desired. User roles. Your category will only be visible to certain user roles. Users. Your category will only be visible to the users that you select here. Once you’ve hidden one or more categories via either method, go to WooCommerce → Settings → Products → Protected categories to configure a few more basic settings. One especially important group of settings is Category Visibility. If you want to completely remove a Woo category from the shop page, you should uncheck both boxes. Alternatively, tick both boxes to still display the category, but require users to enter a password or login to see its contents. How can people access my hidden categories? Create a central category login form by adding the shortcode [category_login] to any page. Customers will be directed to the hidden category with the password they have entered. Once unlocked, the customer will be able to see the protected category and products on the main Woo shop page. The protected content will remain hidden from everyone else. 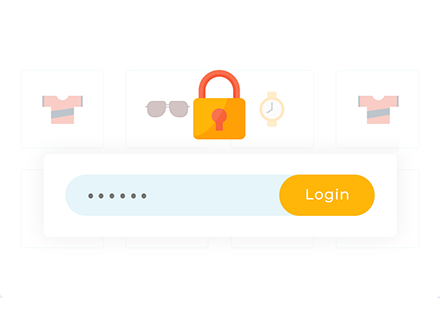 Tick the ‘Catalog Visibility’ option on the plugin settings page so that the hidden categories and products do appear on the WooCommerce shop page, but customers must enter a password to access the content within. Tick the ‘Catalog Visibility’ option to show the hidden categories and products in menus and widgets. For example, this will allow you to add menu links to your hidden categories, and to show the hidden products in WooCommerce ‘Products’ widgets. User and role restricted categories and their products will automatically appear when a customer with the correct privileges logs into their user account. The hidden categories and products will then appear everywhere in your store, such as the main WooCommerce shop page, in navigation menus and widgets. The hidden categories will remain invisible to all other users. 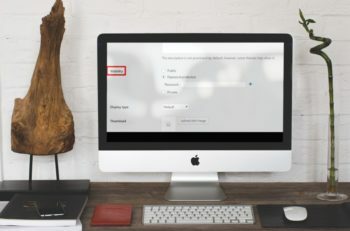 If you want to automatically redirect users to a specific category when they log into their account, then we recommend the free Peter’s Login Redirect plugin. This lets you choose where specific roles or users are forwarded after logging in. With WooCommerce Protected Categories, you can hide a WC category from the shop page in just a couple minutes without writing a single line of code. Do this for as many product categories as you like. For more information, you can see a live demo or consult the detailed documentation. And if you have any other questions about how to hide a WooCommerce category from the shop page, leave a comment and we’ll do our best to help. Hi...thanks for the write up. Yes, you can do this. You can manually add information about the hidden product to a normal page on your site, and/or you can add a Custom menu link to the hidden product. When someone clicks on a link to the hidden product, they will have to login or enter the password (depending on how you have chosen to protect it) before they can access the single product page or add it to the cart. Hi, I have an Affiliate Marketing shopping site featuring products, using WooCommerce with Datafeedr to feed the products. Periodically a Merchant will go temporarily offline from the Affiliate Network they belong to. In that case I need to be able to "hide" the Category so that I don't have to delete it. The subcategories won't show up if the main category is not visible, so I think that would solve my problem. Am I understanding properly that this is what this plugin is intended to do? Hi Connie, yes you can use the plugin for that. It's really easy to temporarily hide a category as you just edit the category (under Products > Categories) and use the visibility settings to restrict it. You can then set it back to Public when the affiliate is available again. 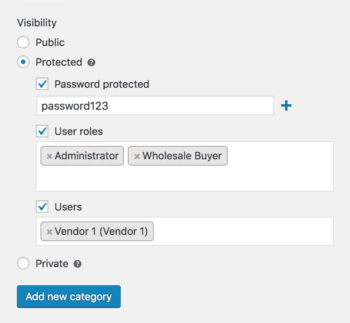 On the WooCommerce Protected Categories plugin settings page, there are settings that let you choose whether to show or hide products from protected categories in the public parts of your store. You should leave these disabled for your user case, and then the affiliate's products will be completely hidden from public view. Hi Katie, thanks so much for your quick reply. I am going to order your plugin. This will really help, as Merchants come and go from time to time, and it is so much work to remove them and then add them back. It is so unprofessional when I have links that are broken due to the Merchant dropping, and this will help me resolve the situation quickly. Thanks again! Glad it was helpful, give us a shout if you have any questions when you set it up!